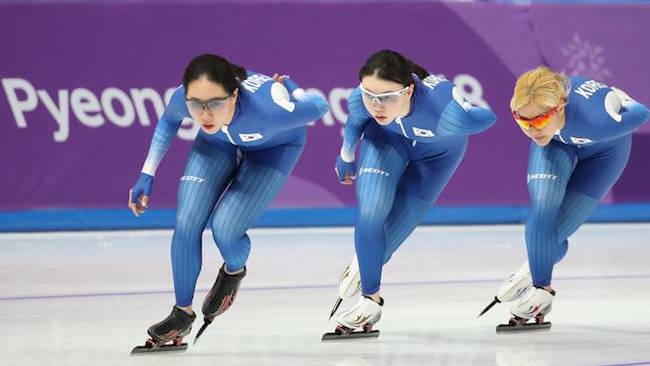 PYEONGCHANG, Feb. 21 (Korea Bizwire) – Moments during and after the South Korean women’s team pursuit quarterfinals performance at the PyeongChang Oympics has sparked an uproar that has yet to settle. Despite finishing seventh out of eight teams that day, the reason for the public outrage has not been the team’s poor record, but what was perceived to be a display of poor teamsmanship. Two moments that took place on the day of the February 19 race have been singled out for criticism. The first was when Kim Bo-reum and Park Ji-woo crossed the finish line without slowing down and waiting for teammate Noh Sun-young, who was lagging far behind. The second was when Kim, during a post-match interview, appeared to be indirectly casting blame for the poor finish on Noh. In team pursuit, since the last skater to cross the line determines the group’s record, it is customary for athletes to finish the race together. Public condemnation for Park and Kim was swift, though Kim, no thanks to her interview, was especially targeted. 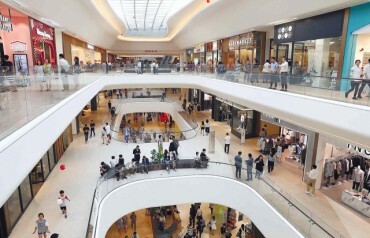 Local media noted that Kim had made private her Instagram account due to enraged South Koreans flooding her with negative comments, while outdoor clothing company Nepa, her sponsor, bowed to threats of a boycott by promising it would not look to renew Kim’s endorsement contract after the Olympics. Others chose to vent their fury on the presidential Blue House’s public petitions webpage. 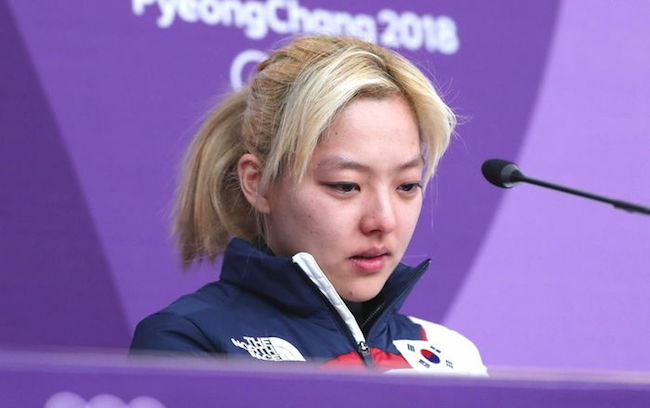 In a mere three days since the Monday race, an appeal to the president to revoke Park and Kim’s status as Olympic athletes and initiate an investigation into factionalism at South Korea’s skating association (Korea Skating Union) garnered over 500,000 votes. The Blue House must officially address any petition that receives 200,000 votes within a month’s time. Other petitions whose total number of votes has elicited an official response deal with issues such as abortion and cryptocurrency regulation. With rumors that Noh is an outcast on the team floating to the surface, coach Baek Cheol-gi and Kim Bo-reum held an emergency press conference on February 20, an uncommon occurrence for teams with a match remaining, to try to right a narrative spiraling out of control. 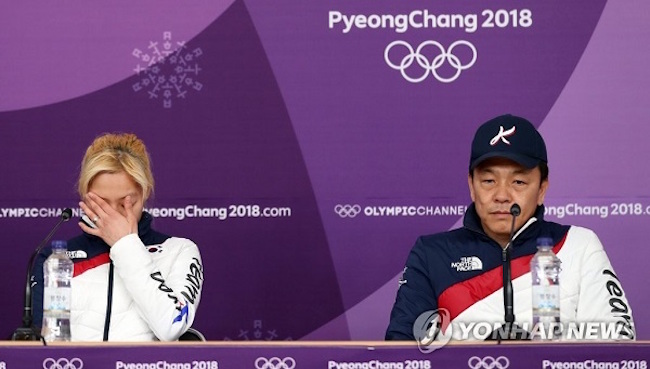 While Kim shed tears and apologized, and Baek attempted to take responsibility for the scandal, attributing Noh’s delayed finish to faulty planning, that Noh was not present due to illness only deepened suspicions of internal discord. For their last match, on February 21 the trio took to the ice against Poland, which had placed last in the quarterfinals, and lost, coming in eighth in the 8-country competition. Factionalism in South Korea’s speed skating has a long history. It manifested most prominently in the lead up to the 2006 Winter Olympics in Torino, when skaters from Korea National Sport University – South Korea’s premier postsecondary sports institution – were granted special treatment by being trained separately from other skaters. An indignant public was quieted when Ahn Hyun-soo and Jin Sun-yu each won three gold medals, temporarily laying to rest a controversy that would become, like the Olympics it accompanies, a quadrennial event. 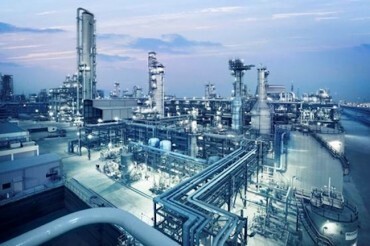 Four years later at the Vancouver 2010 Winter Olympics, allegations of factionalism seeped out once more, this time after the Winter Games culminated. Reportedly exhausted by the sport’s internal dynamics, in 2011 national hero Ahn Hyun-soo became a nationalized Russian citizen, a decision that would haunt South Korea a few years down the road. Now going by Viktor, at the Sochi 2014 Winter Olympics Ahn matched his gold medal haul of 2006 for Russia. The South Korean men’s short track team did not win a single medal. What followed Viktor Ahn’s victory was the voluntary resignation of the man known as the godfather of South Korea’s short track speed skating, Jeon Myeong-gu, in March of the same year. Ahn’s father had identified Jeon, who was the vice-chair of the Korea Skating Union, as playing a significant role in his son’s decision to abandon his home country. Besides the title of godfather, Jeon was also referred to as a “gold medal manufacturer” for the success the national short track team had under his tenure. However, he was also tied to the Korea National Sport University factionalism case in 2006. Jeon’s time away proved to be a short one. Last February, feeling that South Korea’s skating team needed to boost its performance, the Korea Skating Union brought Jeon back to his old position of vice-chair. This time however, the godfather was tasked with helping speed skating as a whole, as well as figure skaters. 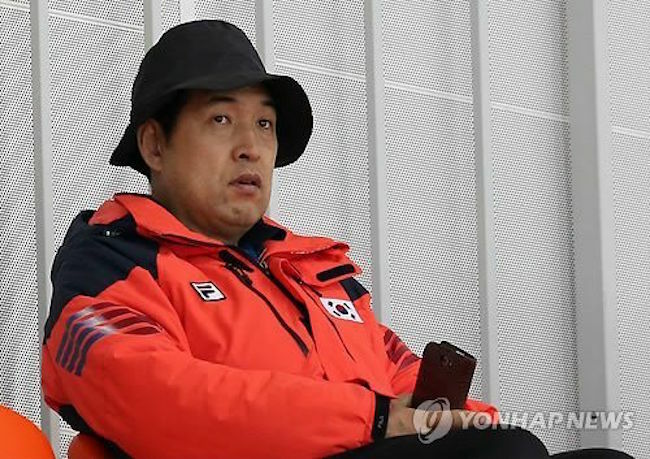 Since his return, Jeon has been accused of once again playing favorites and granting special privileges to athletes from Korea National Sport University. It was Noh Sun-young who revealed the identities of the favored athletes. In January, Noh said in an interview that her teammate Kim Bo-reum among others were receiving separate training. She additionally revealed that the woman’s team pursuit members had not trained properly together since December. Noh gave the interview after learning she had been disqualified from competing in the Winter Olympics, which was in fact cause by an administrative error at the Korea Skating Union. The ban on Russian athletes by the IOC opened the door for Noh to rejoin the national squad. With a “medals over everything” attitude attributed to the Korea Skating Union and South Korean skaters continuing to win medals, whether real change will come remains to be seen.